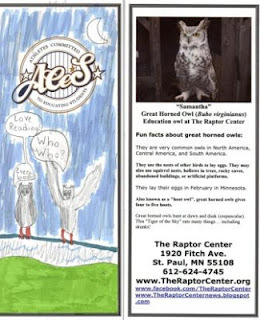 The Raptor Center: TRC and ACES - a Great Partnership! Edia and Carissa show their bookmarks. Also pictured: Mona, Catherine, Gail and Pi the bald eagle. There were many creative ideas! 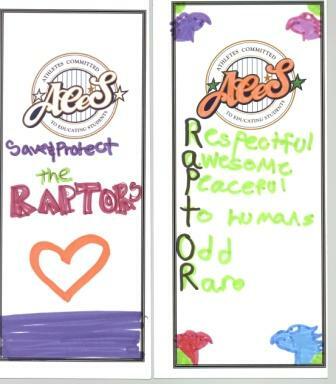 The Raptor Center is proud to partner with ACES - Athletes Committed to Educating Students. The mission of ACES is to close the academic achievement gap of at-risk urban students in grades four through eight. The students are very interested in owls. Each year The Raptor Center provides programming and learning opportunities for them, and the students engage in a service learning project that helps The Raptor Center. Some past projects have included making raptor lunch boxes (props for teaching what raptors eat), puzzles for our children's area at The Raptor Center, and giant owl pellets for programs. This year the children created bookmarks that will be given out at TRC programs and sold in our gift shop to help feed our raptors.